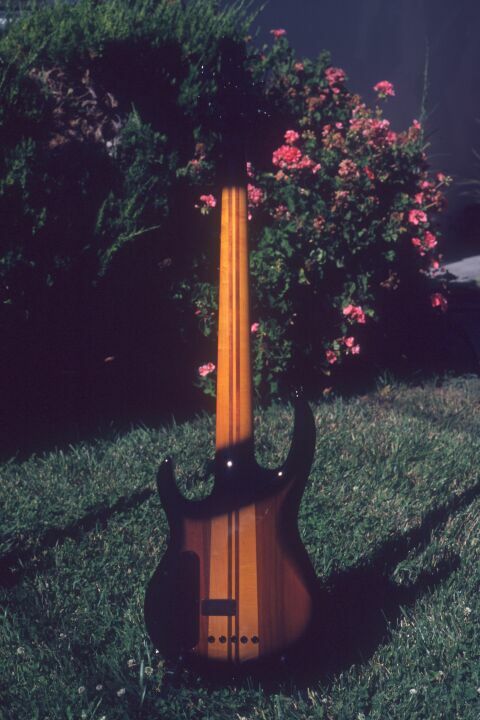 This bass was the star of my collection... until the LB76 arrived. It's still the tone monster of the collection. 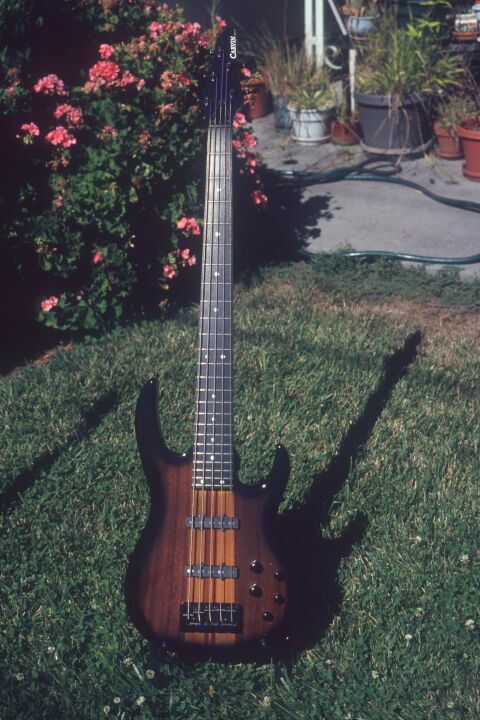 I bought this LB75 in July 2000 at the Carvin factory store in San Diego, the day after buying the DC400. This was the most resonant 5-string hanging on the wall, thanks in part to the wide, 5-piece laminated neck. The fact that it had a bargain price tag ($769 without case, if memory serves) didn't hurt either! The neck is laminated from 3 pieces of maple and 2 pieces of koa, and continues from the headstock through the length of the body, right down to the strap peg. The body wings are also koa. Tuners are Carvin's private label (made by Gotoh, I believe). The bridge is made by Hipshot to Carvin specifications, and allows through-body stringing, which I feel adds to the incredible sustain. The combination of woods and the wide neck option give this bass tone for days, and the tobacco sunburst finish highlights the wood combination nicely. This is one instrument that looks as good as it sounds, and sounds as good as it looks. Its one weakness is a dead spot at the 7th fret on the G string. I believe this was a 1998 or 1999 model, because the truss rod cover attaches with 3 screws. More recent Carvins use a single screw to attach the cover. 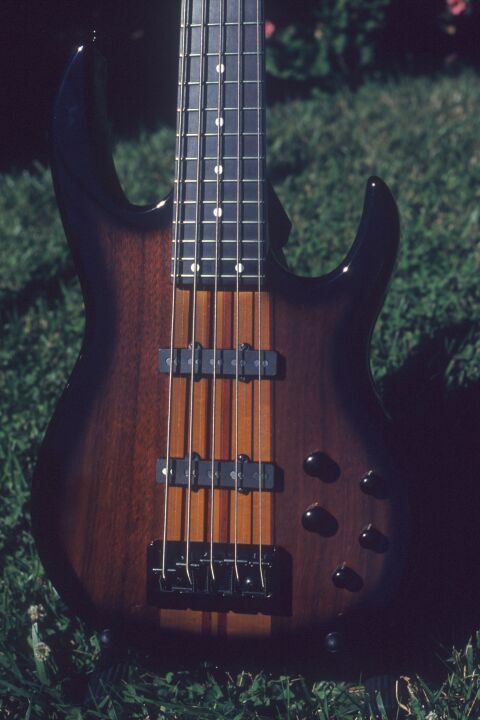 Everything else about this bass is identical to current production LB75s. Originally equipped with Carvin's standard J99 single coil pickups, this LB75 now has a pair of Sadowsky single-coils which I bought used off the DudePit BBS for a mere $60. What was already a very solid-sounding bass became positively thunderous! Since both the J99 and the Sadowsky pairs come with one pickup reverse wound, reverse polarity, hum is unnoticeable when both pickups are blended. All current LB75s come with active/passive electronics powered by a single 9V battery. In active mode, you have master volume, pickup "pan" or blend, and 3 cut/boost tone controls: bass, treble, and midrange. The tone controls have detents in the center "flat" position. The bass control affects the low bass part of the spectrum, what I call "rumble". The mid control actually affects the mid-bass and low-mid region, which I think of as "thump" or "impact". Boosting the mid control yields a very punchy tone; turning up the bass puts you in the dub reggae zone. Turning both up at high volume levels could seriously damage your amp, and no, I'm not kidding! Active gain is adjustable from unity (0 dB) to about 2.5x (about 8 dB). I leave mine set at unity gain. That way, if I switch to passive mode during a performance, the level remains constant. Pulling up on the volume knob switches the bass into passive mode. This is a "true bypass" switch. Only the master volume and the pickup blend control work in passive mode. I've also swapped in a different op amp chip in the preamp. Carvin uses the On Semiconductor MC33178, which is a surprisingly good choice for this application; it offers an unusual combination of low power drain, reasonable bandwidth, and very low noise for high-impedance sources (like bass pickups), and is very inexpensive. However, I couldn't leave well enough alone. I substituted an Analog Devices OP282, which has better bandwidth and slightly lower voltage noise, in exchange for more current noise and about 3x higher current drain. Battery life is still in the hundreds of playing hours; the jury's out on the difference in noise level, as I can't hear either chip's noise at normal playing levels. I have yet to have a battery die on me. The wide neck took some getting used to. However, it's not unreasonably wide, and the standard 3/4" spacing at the bridge is great for slapping and popping (not that I do either very often, mind you!). But the extra wood adds weight, of course, and it tends to "neck dive" a bit. On the positive side, the neck has been very stable, and I think the mass of the wide neck is the primary reason for the solidity and resonance of this bass. The low B absolutely thunders, especially since the Sadowsky pickups were installed! The Carvin factory setup (action and relief) seems to be optimistic for my playing style, so I've raised the bridge and backed off the truss rod to a happy medium. I've found that every Carvin I've ever owned had a slight low spot in the neck around the 5th to 7th fret positions; I have no idea why. This is a minor nuisance, and the resulting fret buzz is inaudible through the amplifier. I wish this bass had rounded body sides (option code RB). The squarish edges tend to dig into my plucking hand, one of my few complaints with this bass. At this writing it's strung with Thomastik-Infeld Power Bass roundwound strings. These strings have tone like you wouldn't believe. Since I switched to T-Is I've been getting a lot of compliments for my tone. But my search for the perfect low B string continues. I usually leave the bass in active mode, which seems to give a more even frequency response at both the low and high ends of the audio spectrum, though the difference from the passive mode is slight. The tone controls are left flat for the most part, and the pickup pan pot left centered for hum cancellation. I have recorded this bass with just the neck pickup, and it sounded incredibly fat! Here are some more pictures showing various details of this fine instrument. A closer look at the body reveals the grain in the koa body wings. 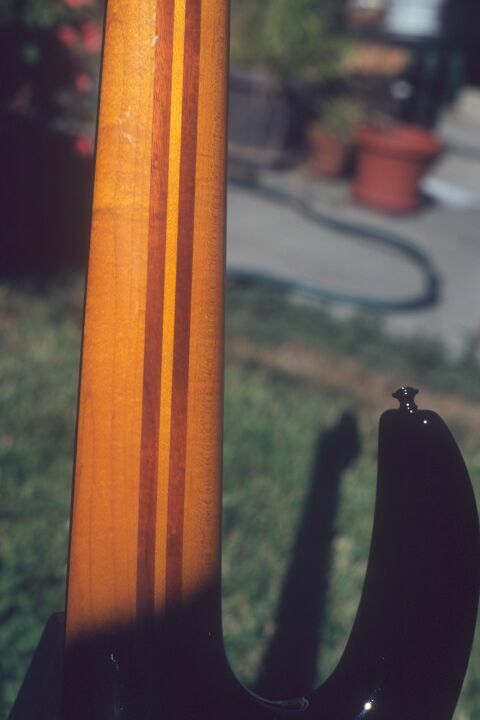 This rear view shows the tobacco sunburst theme continues on the back of the body, and even the neck. Note the grain in the maple of the neck, and the smooth neck heel. Maple/koa LB75 / http://www.chucko.com/Carvin/LB75-koa-maple.html / Copyright © 2002 Chuck Fry / All rights reserved.